Home > Articles and Reviews > Dehumaniser! The Sound Architect was fortunate enough to try out Dehumaniser from Krotos Ltd. The concept of Dehumaniser is a real time voice changing software that will enable to use either presets or your own settings to create a monstrous voice while recording voice or after it is recorded. Sam Hughes has a little play and gives his opinion below! So it’s really up to you and what you need from the product! The Lite version is a fantastic introduction to the software. As you can see from the interface, there’s already a lot to keep you busy! As you can see, you’re pretty sorted when it comes to creature voices and sounds. However you can mess around with the settings and save your own presets. I especially love how you can adjust the percentage of creature in the Voice Designer! It amuses me that I can create something that is made up of 20% Mammoth, 15% Little Dragon and other creatures! 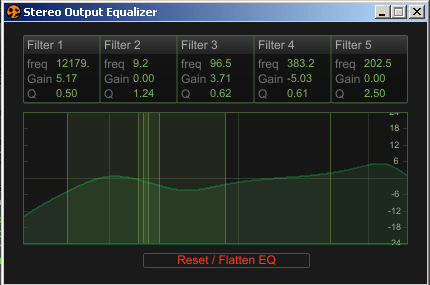 There’s also a Stereo Limiter you can work with as well as a built in Equalizer. These are great for just calibrating the sound even more to what you might require. With the Advanced version you get to experiment a lot more with the settings inside of Dehumaniser, giving you a lot more control over the parameters of your voice or sounds. The Simple Mode is very much like the Lite version and still enables you to use a vast number of different presets to try and achieve the sound you are after. It also allows you to change certain parameters once you are using a preset to calibrate the sound to your desires. The real test of bravery however, is using the Advanced Mode. Advanced Mode opens up a new world of parameters to change. This is where you can really tweak the finer aspects that affect your audio. There are so many options open to the user in this mode it is crazy! A couple of highlights for me are Dual Plug-ins and Routing. Routing: As seen below, the routing also gives you great customisation over all the parameters within the system, enabling the user to have complete creative control when affecting the audio. All the other controls include: Sample Player, Spectral Shift, Granular, Cross Synthesis, Noise Generator, Pitch, Delay Pitch Shift, Poly Pitch Shifting, Animal Convolution. One of the many great things with Dehumaniser is that it can be used stand-alone or through different patch techniques with your DAW. However the exception to the rule as with a lot of software at the moment appears to be Pro Tools 11. The fact that the software can work real-time or with recordings. Now, obviously the Dehumaniser is great for vocal manipulation and getting those creepy/growly/monstrous vocal sounds that you want. Great. However, I’ve had a lot of fun putting through some sound effects for some interesting sound design effects! Firstly, thanks for taking the time to answer a few questions for us. Thank you for giving me this great opportunity. Before we talk about Dehumaniser tell us a bit about yourself and your career path? Since I was a kid I liked music and computers. I was also playing electric guitar and sometimes I was recording music on my computer using a chat microphone (on Acid 1.0!). I found this procedure exciting and I decided to study something that combines music and computers. My first degree was a BSc in Music Technology and Acoustics. After my graduation I worked for a couple for years in Athens in audio post-production, location recording for commercials, documentaries, Tv-shows and short films. Additionally, I did music composition for commercials. Afterwards I decided that I wanted to do something more creative and I moved to Edinburgh where I did my MSc in Sound Design at the University of Edinburgh while doing some freelance projects. For my final project I made the Dehumaniser prototype. After posting a video demonstration online, sound designers started showing great interest on the project so I put it on my webpage for free to download. Afterwards I started receiving e-mails from acknowledged professionals in the industry that used the software for many films and games all over the world. I was very excited about that and after getting feedback from all these professionals I started working on the commercial version with the assistance of Nick Konstantakopoulos. After getting funding and advice from the University of Edinburgh I incorporated Krotos LTD and we released the commercial version of Dehumaniser in November 2013. What inspired you to create Dehumaniser? I had worked on a sound design podcast and an audio game where I experimented a lot with human voice and animal sounds in order to create monster and creepy sounds. I found the procedure exciting, (especially the part where you scream in a mic trying to make weird sounds) but time consuming. I had to use many plugins, go through many animal sounds, layer them and shape them in order to create the wanted sound. Then I came up with the idea of trying to make a software that would include all you need to make these sounds in real time but also gives the options to customise the result. A software that would include all the effects that sound designers use along with the option to use animal sounds within the workflow. Can you tell us anything about the process? Creature and monster sounds exist in many mediums, including sci-fi, horror and animated films as well as video games. In order to create these sounds, different methods of sound manipulation are used. These methods usually include many layers of sound and various processing techniques. In order to design this project I had to identify the important features that contribute to create these kinds of sounds. Additionally I had to consider how these techniques can be used in order to transform the voice into creature sounds in real time as well as how effective the real time transformation is. Dehumaniser combines most of the effects that professionals use for making monster and creature sounds into a single interface. You can use a microphone and perform while your voice is being transformed in real time or use samples as an input. The signal splits into layers, passing through the effects and creating a multi-layered sound. It has 35 predesigned presets for creatures, monsters, experimental voices and dialogue. It includes 11 sound manipulation techniques that you can affect individually including granular, convolution, pitch-shifters, sample player and procedural audio components. It also gives you access to numerous options such as applying different effects depending on the input level (sensitivity option), custom routing, EQs, limiter and more. Finally it includes an animal sound library that the user can use for convolution and as a result you can give an animal timbre to your voice or perform with them using the sample player. Dehumaniser lets you perform in real time. Making creature and monster sounds using voice in real time is a more intuitive process than sound editing. Voice is our basic way of expression. The transformation of voice into these sounds transfers emotions and expressions and makes this procedure more direct. On top of that each voice has a unique timbre, as a result using a single preset on Dehumaniser and your voice you can create unlimited sounds in seconds. Tell us some of the basics about the practical uses of Dehumaniser that people might not consider? Except from using Dehumaniser to create monster sounds, it can be used for making robot voices, whooshes, drones and other sound effects. You can experiment by using any musical instrument as an input or pre-recorded samples. The sound designer Angelo Palazzo for example used horse sounds as an input in order to create the demon horse in Sleepy Hollow. Also using instruments like bass, piano or electric guitar can create very interesting sound effects. Additionally it can be used in live performances such as theatre and even inside actormatronix where the actor inside the costume can perform in real time using a wireless mic. What do you use Dehumaniser for at the moment? I use it for sound design projects or even music. Recently I used electric guitar with Dehumaniser to create the soundtrack for a horror film. I was performing in real time by playing the guitar while watching the film. What do you think are the main differences between Pro and Lite that would sway a user? The Lite version has 35 predesigned presets and the voice designer interface, which allows you to create hybrid presets. It is for users that prefer to use the predesigned presets such as voice actors, directors or professionals that want to get things done quickly without much hassle. The Pro version has the same functionality with the Lite version but gives you access to the advanced mode. Therefore, you can adjust the settings of every single layer of sound and every single option that affects the sound, including EQs, limiter, sensitivity, custom routing etc. It also allows you to use your own VST and AU units within your workflow. Dehumaniser Pro is for advanced users that want to create their own unique effects and take advantage of the unlimited potentials that the software can offer. What lies in the future for you now? My main target is to grow the company and find the right people in order to make a powerful team. The plan is to keep improving the software and create unique sound design tools that can contribute to the audio professional community and improve the process of designing sound effects. On top of that, there are plans for creating versions for mobile devices that could be used by everyday users. At the same time I want to keep doing sound design for side projects, which I really enjoy. Overall I would say that not only is Dehumaniser a lot of fun it can be a speedy process in getting your creature voices to sound exactly how you wanted, or even better. I would definitely recommend experimenting with different SFX possibilities as well. With all the presets as well as controls available to you, there are an infinite number of things you can do with different sound played through there, REAL-TIME!! !